Backed with immense industry-experience, we are offering a wide assortment of Chyawanprash Filling Machine. This machine used for filling sauces, curry pastes, ointment, wax polish, grease, jam, etc. The offered machine is manufactured in adherence with industry quality standards using the best quality components and latest technology. Our machine is available in different sizes and other related specifications according to the needs of the clients. 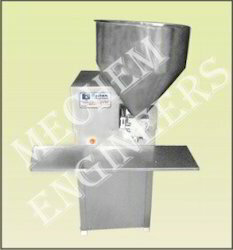 Established in the year 2005 in Ahmedabad (Gujarat, India), we “Mechem Engineers” are renowned manufacturer and Supplier of a wide range of Automatic Cup Filling Sealing Machine, Automatic Liquid Filling Machine, Automatic Carton Code Printing Machine, Automatic Glue Labeling Machine, etc. These machines are used in pharmaceutical industries, beverages, cosmetic, dairy, food, pesticide, distillery and allied Industries. In compliance with international norms, these machines are manufactured using high quality components and latest technology. These machines are acknowledged for their features like easy to operate, high performance, robust construction, anti corrosive, less maintenance and long service life. In order to ensure quality, our machines are inspected by our quality controllers on different parameters of quality. As per the needs of our clients, we provide these machines in different specifications.